"Building on the solid base of their book Head, Heart, and Guts, Dotlich, Cairo, and Rhinesmith lay out the ways to become the kind of leader needed to navigate through today's complexities and uncertainties. Leading in Times of Crisis is a necessary guidebook to survive and thrive in the global perfect storm." "The risks and opportunities that confront today's leader have never been greater. 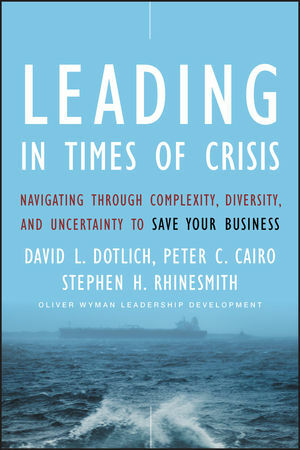 Leading in Times of Crisis provides unique and valuable insights, along with straightforward principles, that will help point the way in an increasingly diverse and rapidly changing environment." —Ken Frazier, president, global human health, Merck & Co., Inc.
"This book blends practical business solutions with useful insights about leading people.It should help anyone looking for new ideas to deal with the uncertainty and complexityfacing leaders everywhere today." "The main message of this provocative book is that leadership as we have known it ischanging rapidly and dramatically. Moreover, research shows that well over half of people in leadership positions fail. The challenge for leaders today is daunting. But a carefulreading of what Dotlich, Cairo, and Rhinesmith have to say from their extensive experiences will help to reduce significantly this troublesome failure rate." "Research demonstrates that the #1 leadership competency in shortest supply is 'dealing with ambiguity and complexity.' Dotlich, Cairo, and Rhinesmith give you the real-world tools to actually do it. This book helps us to reach deep inside ourselves, our organizations, and our markets to achieve dynamic, sustainable success. Get this book to effectively navigate change, inside and out!" David L. Dotlich is an adviser, author, researcher, teacher, and speaker on leadership, business strategy, developing high potential, and succession. He was formerly executive vice president of Honeywell International and is the founder and former president of the Oliver Wyman Executive Learning Center. Peter C. Cairo is a senior partner of the Oliver Wyman Executive Learning Center and is former chairman of the Department of Counseling and Organizational Psychology at Columbia University. Stephen H. Rhinesmith is a senior partner of the Oliver Wyman Executive Learning Center. He is former special ambassador to the Soviet Union and was president of Holland America Line. Dotlich, Cairo, and Rhinesmith are the authors of Head, Heart, and Guts. Dotlich and Cairo are the authors of Why CEOs Fail, Unnatural Leadership, and Action Coaching, all from Jossey-Bass. Delta Organization & Leadership LLC, a unit of Oliver Wyman, provides a unique combination of consulting services and customized programs to help CEOs and other senior leaders transform individual and organizational capabilities in ways that will enable them to compete, to succeed, and to grow. 1 Navigating the Perfect Storm: Complexity, Diversity, and Uncertainty. 2 What You’re Up Against as a Leader Today. PART TWO: Nine Ways to Navigate the Perfect Storm Through Whole Leadership. Sect ion One: Navigating the Wave of Complexity. 3 Destroy and Rebuild Your Business Model. 4 Focus, Simplify, and Network Your Organization. 5 Build a Climate for Innovation. Section Two: Navigating the Wave of Diversity. 6 Differentiate and Integrate Your Markets. 7 Learn to Lead Everyone. Section Three: Navigating the Wave of Uncertainty. 9 Redefine Risk and Uncertainty. 11 Be Clear What You Have the Courage to Stand For. PART THREE: Developing Whole Leaders and Teams. 12 Aligning Your Company’s Talent to Navigate the Storm. 13 Aligning Your Team Around Whole Leadership. 14 Developing Yourself as a Whole Leader. 15 Navigating the Perfect Storm: A Final Thought: Why Whole Leaders Will Succeed.